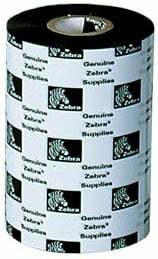 The Zebra 2100 Enhanced Wax ribbon is formulated to print up to 12 ips on coated paper. Provides superior abrasion resistance when compared with conventional wax ribbons. Provides minimal resistance to smearing and chemicals. The Zebra 02100BK13145-R is also known as ZEB-02100BK13145R	or 02100BK13145R	.